Time to sell your Spinnaker Pointe condo? Read about today's resort-market condo buyer. Spinnaker Pointe is located in the West Beach area of Gulf Shores, Alabama, just one mile west of the "T" in downtown Gulf Shores. There are ten units and they were built in 2005. 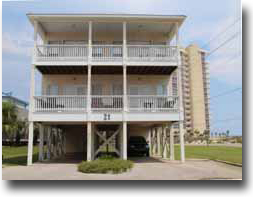 The complex shares an outdoor pool and a convenient location in central Gulf Shores. The units have indirect views of the Gulf of Mexico and Little Lagoon. Spinnaker Pointe is comprised of three-bedroom condos at 1,300 square feet. Please let us know if you would like further info for Spinnaker Pointe or any other condos, homes, or real estate along the Gulf Coast or would like to schedule a private viewing by emailing info@condoinvestment.com or by calling (251) Area-Pro (251-273-2776) for immediate assistance.